What are the Benefits of Wool as a Fabric and Why is Wool Better Than Cotton? Although the popularity of wool has declined somewhat since the introduction of synthetic fabrics, wool is still a wonderful material for clothing and blankets. It’s warm, and it’s soft, and it comes from sheep. It’s naturally flame resistant, so it’s safer than many other materials used in clothing. And unlike goose down, which many jackets and bedding are filled with, when wool gets wet, it still insulates and keeps the wearer warm. Because it is fire resistant, wool is usually specified for garments for fire-fighters, soldiers, and others in occupations where they are exposed to the likelihood of fire. 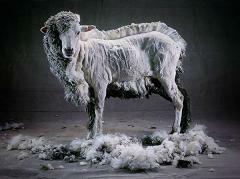 Wool is also considered to be hypoallergenic by the medical community. Why Do Clothes Shrink and Why Does Cotton and Wool Fabric Shrink More Than Synthetic Fibers? Why is Wool Warmer Than Cotton and What Else is Wool Used For Besides Clothes, Carpets, and Furniture?